This observatory is performing fundamental research of volcano phenomenon, and evaluation of the degree of volcanic activity or research of volcanic eruption prediction through observation of the volcanic activity for prediction research of the structural earthquake accompanied by the north-south extension phenomenon of the Beppu-Shimabara graben which is crossing central part of Kyushu, and Amakusa graben which is one segment of the Okinawa Trough which stands in the row in the southwest, or the inland type earthquake by observation of a diastrophism, and the Unzen volcano. Especially, the Unzen volcano is situated in a position unique on the geological structure in southwest Japan called the meeting point of the Beppu-Shimabara graben and the Okinawa Trough, it is thought that the activity has the relation closely with these tectonic movements, and it is the optimum ground for synthetic research covering both fields of earthquakes and volcanoes. Although earthquakes are the destructive phenomenon of the crust, the observation is to the foundations of the earthquake prediction and volcanic eruption prediction research. Always, as observation equipment, this observatory holds 16 networks of seismic observation of the central part and the northern part areas in Kyushu, and 9 networks of seismic observation of the Unzen volcano area, and is performing continuation observation on the real time by telemeter. As for this telemetry system for observation of earthquakes, four points were first equipped as the part of the first and secondary volcanic eruption prediction plan (1974-1983), and they are the purpose which grasp movement of magma to the highest peak of Mt.Fugen which is the eruption point since the history started, from the Chijiwa caldera of the Unzen volcano western side assumed at the time of the eruption, and they are arranged so that these may be surrounded. After that, it inherits in the 5th earthquake prediction plan (1984-1988), and was expanded on the total observation network of 11 points for the Amakusa graben and the Shimabara-Kumamoto graben, which are earthquakes frequent occurrence zones. Furthermore, in the 6th and the 7th earthquake prediction plan (1988-1998), the extension to the observation network for the whole region of the central part and the northern part of Kyushu is achieved, and it is always observing by 16 observing points of earthquakes now. The data signal from the observing point of every place is conveyed by the cable telemetry system by NTT dedicated line (D1 standard) in the Shimabara base observatory, and is acting as the monitor by Pen Recorder for a long time. Furthermore, earthquake data automatic processing equipment introduces, it comes to perform automatic focus determination processing of earthquakes, and the grasp of a quick earthquake generating situation came to be made 1992. One of the axes presumed to have arranged like the group of a wild goose in the Beppu-Shimabara graben is the Unzen graben that is crossing the central part of the Shimabara peninsula. Now, sedimentation is continued at the rate of 2 to 3mm per year. Moreover, the western Chijiwa bay is also presumed to be that which sediments doubly and forms the fan in the meeting point with the Amakusa graben, which stands in the row in south-southwest. In order to grasp the actual condition of these crustal movements, the level point and the reference point for a electro optical distance measurement are installed, cooperation of another universities observation organization is obtained, and the 1st survey was performed in the Shimabara peninsula in 1986. Miraculously, since Mt.Unzen started eruption activity for the first time in 198 years in 1990, the survey is carried out again after that and many results in connection with volcanic eruption prediction research are obtained. On the one hand, maintenance of crustal-movement observation institution was always accompanied by eruption activity of Mt.Unzen also achieved, and four borehole type tiltmeters were installed on the outskirts of the volcano in 1992. 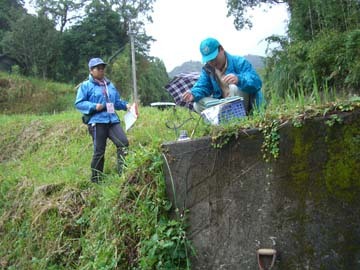 Moreover, crustal-movement observation of Kyushu is also started by introduction of GPS observation equipment.